These photos feature a nice sized install of the Grand Illusions Color Spectrum. The specs are a lot simpler sounding than the install. 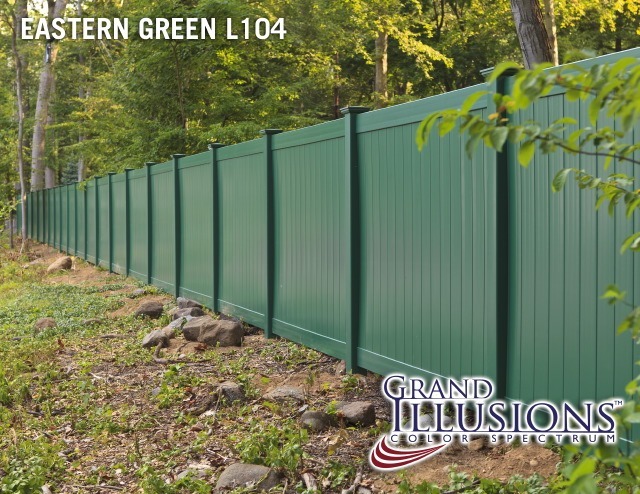 88 Sections of Eastern Green (L104) V300-6 Tongue & Groove Vinyl Privacy Fence. It looks like the fence was installed in a forest. Bending and weaving through trees and brush. Looking at these photos, you can see that commercial future for the Grand Illusions Color Spectrum and Grand Illusions Vinyl WoodBond is amazing.